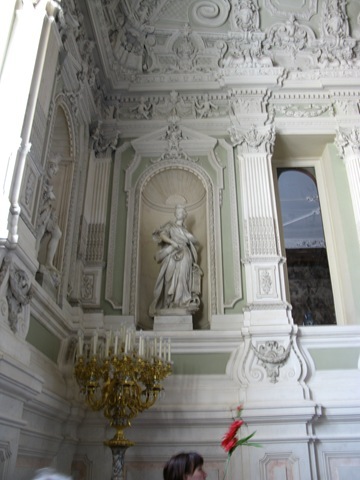 Day 7 (01/07) – St Petersburg, Russia. So, this being the last chance to go ashore in Russia, we naturally stayed on board in the morning which allowed us the luxury of a leisurely breakfast while most of the passengers were already ashore. It also allowed us time to check out our new neighbours. Having got rid of the Italians yesterday, we awoke to find The Emerald Princess and the Crystal Serenity had moved in. There was also another ship called the Gemini but it wasn’t one I’d heard of so it was of no consequence. 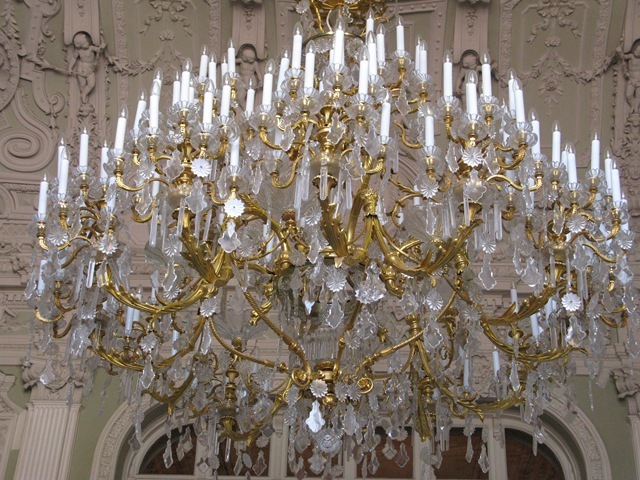 After lunch, which we knew would need, we (Nick & I) set off to check out the Yusupov Palace while Debbie and her Mum went off souvenir shopping, cash & credit card at the ready. 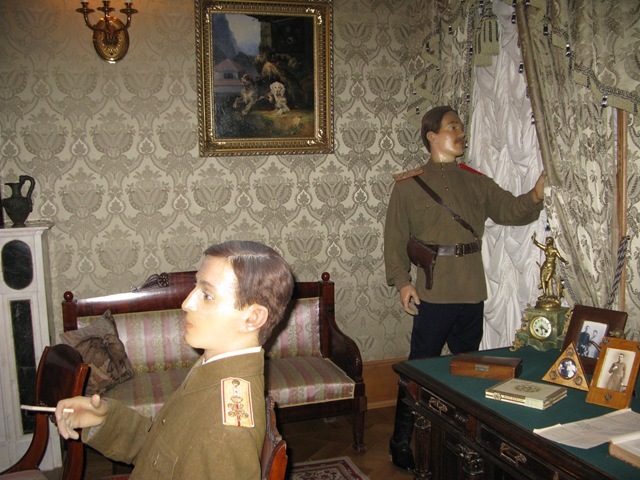 Yusupov Palace was where Rasputin the ‘Mad Monk’ finally met his untimely end. Nicholas II and his wife Alexandria saw Rasputin as a Holy Man who had been sent by God to protect their boy Alexis (heir to the throne). 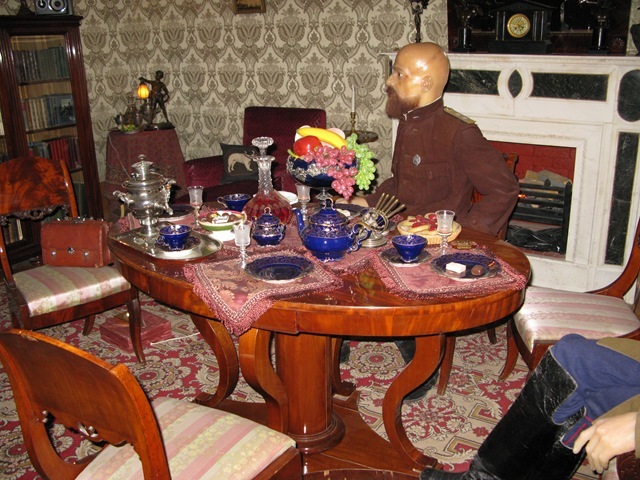 This was because he was the only person who could apparently stop their sons bleeding (he suffered from haemophilia).After a while however, there became an underlying air of concern that Rasputin was too close to the family and as such held potentially too much power. Given these concerns, a group of aristocrats in league with the Grand Duke Dmitri Pavlovich (a cousin of Nicholas II) and Prince Felix Yusupov got together in 1916 to ‘save Russia’ by assassinating Rasputin by meeting him for a drink and for his to be laced with Cyanide. Unfortunately, they didn’t know that Cyanide was neutralised by the drink they put it in! 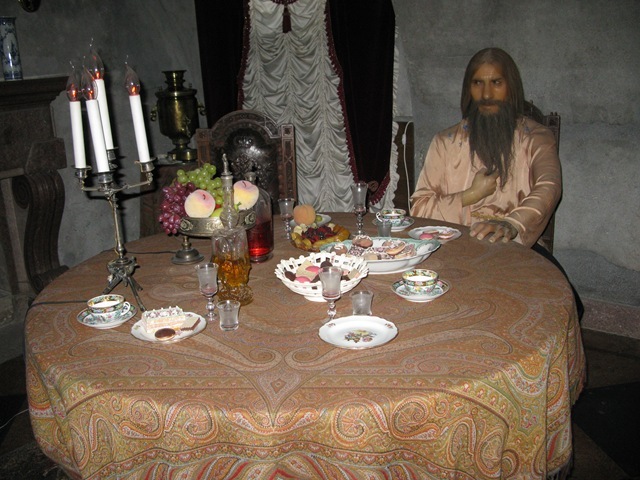 The images below show the recreation of the room under the Palace where the assassins waited for Rasputin to die after being [unsuccessfully] poisoned with Cyanide and then shot at point blank range. Even the shot failed as Rasputin managed to get out of the room and into the courtyard before being shot again. This time, satisfied the monk was dead, they wrapped him in a blanket and through him into the river. Unfortunately, they forgot to weigh him down and he was discovered two days later (he was definitely dead by this time). After the body was retrieved, the doctors performed an autopsy and found that there was water in his lungs indicating that he did in fact eventually die from drowning. 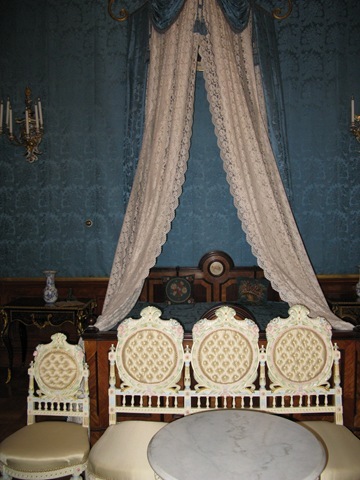 The images below are just a few samples of the Yusupov Palace. 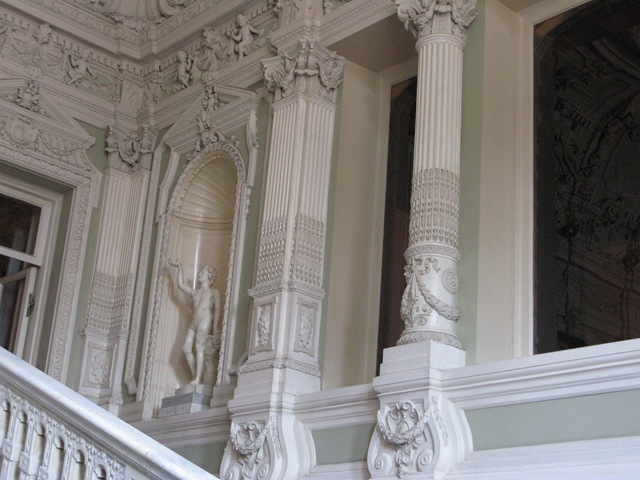 The Palace, located on the Moika Embankment is seen as a fine example of Russian Classicism influenced further by it’s owners, the Yusupov Princes. 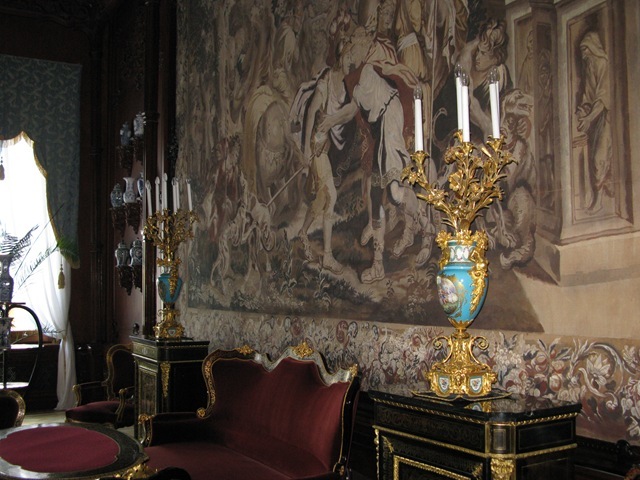 The Princes were indeed wealthy and comparable to that of the Romanovs. 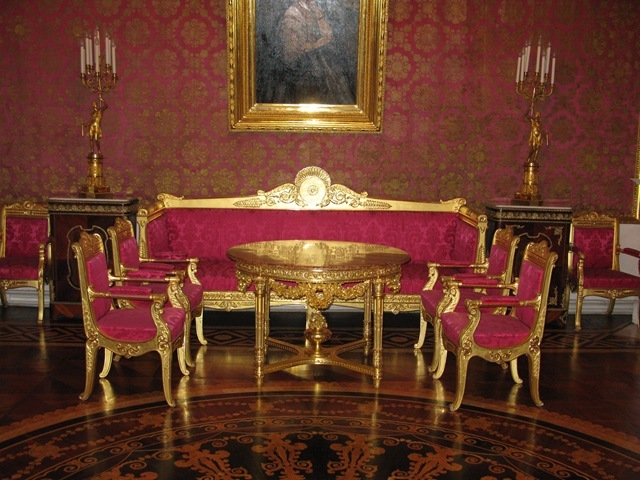 They were great collectors of art although most of what is now in the Yusupov Palace are in fact replicas with the originals having been relocated to the Hermitage after the revolution. Anyway, tour over, we had 20 minutes to browse the adjoining souvenir shop for making those last minute essential purchases. Knowing that Debbie was already hunting down those items we never knew we needed, I opted to buy a book on St Petersburg plus a cheap Russian Doll, decorated for Christmas (you can never be too prepared for the festive season) and some nice Russian Chocolate for any little people we may see when we get back home. When I got back to the ship and showed my bounty to She Who Must be Ignored, I mean, Obeyed, she enquired as to why I had bought another book on St Petersburg, showing me the identical book I had bought yesterday (oops, another senior moment methinks). As for the chocolate, well that was met with approval and of the four bars purchased, only one now remains. She didn’t think much of my doll saying that it looked strangely evil and cheap, which actually it was (cheap that is): It was only 180 Roubles which is about £4 so I couldn’t argue that it was cheap. Her doll however was exactly the blooming opposite. Hers cost 6000 Roubles which worked out to be, a_lot more than mine. After this, Smug Debbie and Dejected Moi, went up to the Sun Deck for a drink and a sticky bun. While there we enjoyed the Sail Away party where free drinks were flowing freely the music was playing and the crew were dancing. Now bearing in mind that all this was taking place around the pool, the inevitable was inevitable and sure enough one of the crew went in the pool. Better still, he was followed by the Cruise Director. Unfortunately, her blouse was inappropriate wear for being in the pool but luckily some concerned passengers offered her towels to cover herself. Still it was all in good humour. Eventually, as the Balmoral sailed onwards, St Petersburg disappeared over the horizon and all went off to prepare for Dinner. Dinner itself was well received and made all the more enjoyable in the knowledge that we had to put our clocks back 1-hour so getting an extra hours sleep. Yippee. After dinner we ‘retired’, again, to the Observatory Lounge for a couple of rather large brandy’s safe in the knowledge that we had an extra hours sleep but forgetting that tomorrow brought us to Tallinn in Estonia and an early start for our tours. Eventually however, we realised and off we went to bed. Did I lose weight today? Did I heck. Maybe, I’ll lose some tomorrow. Then again, maybe I wont! Day 8 (02/07) – Tallinn, Estonia.